Well, it is that season again – a new crop of iPods and other assorted MP3 players will give life to the accessory industry. 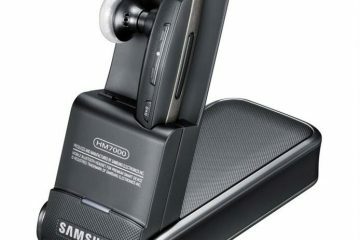 Cases, headphones, sound docks and other systems are beginning to flood the market. If you are like most people, the first thing you will buy after you spend your hard earned cash on a new music player will be a quality set of Earphones. Let’s face it – the bundled headphones that come as ‘stock’ equipment with most MP3 players are terrible. One of those trusted names is Sennheiser – makers of quality audio products for over 50 years. Last year, I reviewed the CX300 and the OMX70 models – both of which earned high accolades. This year, the Classic line has been expanded. The CX 500 is the new top-of-the-range model in the Classic line and comes in high gloss black, high gloss white and titanium. It stands out for having a wider frequency response and special flange ear adapters which give the ear canal phones an even better seal. A convenient volume adjuster maintains total control over incoming audio levels on any playlist or shuffle. The CX 500 comes with a pouch, cable clip and cord winder for an unsurpassed value. The CX 500 are high quality, noise-isolating ear-canal-headphones with a superior, bass-driven stereo sound. They feature a volume control integrated in the cable and come with a new, unique type of ear adapter for an improved fit and even better passive noise attenuation. The CX500’s are an in-ear design. They are not terribly big – in fact, they are about the same size as the wonderfully comfortable CX 300’s I reviewed last year. Sennheiser chose to go with a single micro-driver design. Other companies like Shure and Ultimate Ears use a balanced Armature design in this price range. The micro driver approach allows the CX 500’s to be small enough to be easily inserted in the ear canal with little effort. Unlike other Earphones, there are no callisthenics required to insert these in your ears. Some companies favor the ‘upside down’ design with a cable going behind your ears. The CX 500’s are a simple in your ear design which makes then very easy and quick to put in and take out. The CX 500 comes with many interchangeable sets of silicon tips of varying shapes and sizes. This is always nice since no two ears are exactly alike. Finding a comfortable fit was very easy for me – which is not always the case when it comes to in-ear headphones. One very nice feature of the CX 500’s is the inclusion of an in-line volume control. Now, there is much debate amongst audiophiles as to whether or not an in-line volume control contribute harmonic distortion to the sound. From my perspective, it was a great feature to put in. How often has someone spoken to you when you are wearing earphones and you either need to take them out completely or find your iPod and turn down the volume. Just a quick sliding of the control and the volume is lowered – right from the cable of the earphones. Another very nice feature is that both a leather like pouch and a cable winder and cable clip are included with the CX 500’s. Great sounding headphones aren’t much good if you can’t stand them in your ears. Some people have great difficulty jamming ear buds into their ear canal. Fortunately, I found these Earphones to be extremely comfortable. 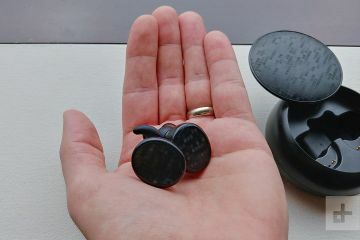 They are relatively small – as far as earphones go – and I had little problem finding a comfortable fit. There was an included double flanged tip that worked well for my ear canals. While the CX 500’s do sit inside the ear canal – they do not need to be ‘jammed’ in so it feels like they are touching the ear drum. The CX 500 also offered good sound isolation. Any in-ear-design will serve as a ‘passive noise canceling’ design. While blocking out most ambient noise – I didn’t feel like I was under water as I do with some in ear designs. I tried the CX 500’s on one of my long bike rides and found these to be great for exercising. They were comfortable, sounded great and seemed sturdy enough to hold up well. As I have said before, this is the make or break issue when it comes to Earphones. I have come to the conclusion that a good pair of in-ear headphones will rival the sound quality of an excellent pair of over-the-ear headphones. With in-ear designs, the music seems to come from inside your head. Instruments can be easily placed on the sound stage and bass and vocals can just come alive. This was certainly the case with the CX 500’s. Now, some Earphones are of the more ‘flat’ or neutral variety. No particular range of the musical spectrum is emphasized over any other – the music is transmitted ‘the way it was meant to be heard.’ Other earphone designs emphasize particular ranges in the audio spectrum and offer ‘music the way you want to hear it.’ The Sennheiser seems to fall into the second category – which is not a bad thing at all. My first impression when listening was that the highs and lows were emphasized. After prolonged listening, my views changed a bit. There is quite a bit of bass in these little earphones. The bass, however, was not boomy or ‘over emphasized’ as is often the case in some designs. The bass is certainly more pronounced than the Shure SE110 which I just reviewed – but it sounded great – tight, clear and full. I found this to be particularly welcomed when I listened to MP3’s on my phone – which don’t have the benefit of an equalizer like the iPod. The highs were clear and bright – but not too bright. I would not classify these earphones as ‘warm’ like I would some that are more ‘flat’ across the audio spectrum. These were ‘fun’ to listen to. Cymbals crashed, bass was crisp, guitar riffs sounded real and really ‘popped’ compared to some other Earphones. I listened to various types of music on the Earphones. I found that for classic rock and roll- these were great. The Who never sounded better on an in-ear headphone – vocals were loud and clear and each instrument was identifiable. I listened to Bruce Sprinsteen’s new album and thought is sounded fantastic. Bass was tight – but not boomy. His voice was clear and pronounced, guitars and instruments (especially Clarence Clemons’ Saxophone) just screamed out. For classical music, these were still good sounding – but not as ‘warm’ as a more balanced earphone would be. My kids listened to hip hop, pop and other suspect musical genres and thought these were way cool. All in all – the overall sound was on par with Earphones costing much more. Sennheiser has a winner here. With an MSRP of $129.00, the CX 500 is right in the sweet spot of some amazing sounding headphones. The combination of an in-line volume control, a very powerful micro driver and lots of bundled accessories makes this a great buy. On the web, they are already advertised for less than the MSRP. 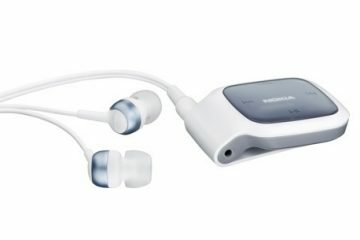 The sound quality is more ‘bright’ than some in ear designs – but I felt they were a lot of fun to listen to. The sound stage was great – I could place instruments in different locations. Vocals ,instruments and bass were all very strong. I found them comfortable to wear for extended periods of time and they work well for exercising. I would certainly recommend that you take a listen to these. Sennheiser is a great name making great audio equipment. 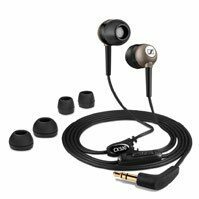 These are affordable and great sounding and a huge upgrade to the bundled ear buds in most MP3 players. The CX 500’s are available at www.sennheiserusa.com and lots of other retailers on line.